Shinjiru Review 2019: Is Shinjiru a Good Hosting? Shinjiru is a Malaysian company that began operations in 2000. They offer a number of shared, VPS, and dedicated server hosting solutions for security-conscious individuals and corporations. Shinjiru is a premium offshore hosting provider that offers a number of shared, VPS, and dedicated server hosting solutions for security-conscious individuals and corporations. Founded in 2000, they’re headquartered in Kuala Lumpur, Malaysia. They currently serve over 40,000 customers. Shinjiru offers their customers total anonymity, data security, and peace of mind from start to end. Since they’re a certified domain registrar, you can register a domain with them and make use of their identity protection features. If you already have an existing website, they’ll take care of the entire migration process free of charge. You can even register and pay for your hosting anonymously. Of course, they provide email hosting as well, so you can rest assured that your written communication will be kept secure. Shinjiru offers a 99.99% uptime guarantee. This is rare for an offshore hosting provider as most offshore hosts are notorious for high latencies and less-than-stellar uptime. 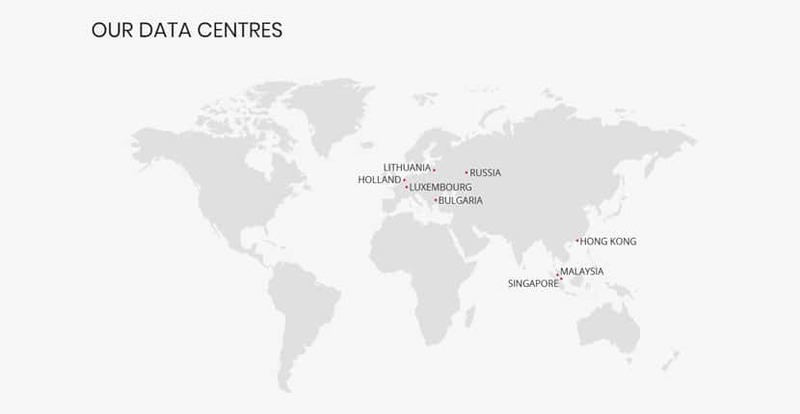 Because Shinjiru has eight data centers located across Southeast Asia and Europe, they offer better-than-average loading times than most offshore hosts that only have servers in a single country. Bear in mind that they have no centers in the Americas or Oceania, so users on those continents may still experience higher latencies than regular in-country hosting providers. They feature a comprehensive anti-DDoS attack protection network, thousands of dedicated servers, IP addresses, and 24/7 monitoring and support. Their various networks have SLAs of up to 99.999% uptime and their data centers are built with failovers, power redundancies, and state-of-the-art equipment and security systems. Shinjiru has a variety of plans ranging from budget-friendly to premium enterprise-grade dedicated server solutions. Their budget offshore shared hosting plans are among the cheapest I’ve seen in the market: these are designed for personal websites, startups, and ventures that require privacy protection and anti-website shutdown. Not only are they extremely affordable, they’re also generous with their resource allocations – the lowest-tier plan offers you a whopping 100GB storage and unlimited bandwidth. When you sign up with Shinjiru, you won’t have to reveal your identity or provide any official documentation ensuring that your anonymity and operations are even more protected. This includes payment options as well: you can pay via Bitcoin, Ethereum, credit card, PayPal, Perfect Money Payment, or wire transfer. Shinjiru is known in the offshore hosting industry for their world-class support team. They claim that “[they] don’t sleep” in their quest to offer first-rate customer support 24/7/365. In my experience, this has been true – even when I contacted them at odd hours, they were always prompt in their responses. According to other reviewers, they even go out of their way to accommodate less-than-ideal customers (such as customers who forget to pay their hosting bill). Shinjiru is also the only offshore hosting provider that’s ISO9001:2008 accredited, which speaks to their extremely high customer satisfaction standards. Shinjiru is a rock-solid offshore hosting provider with unparalleled customer service. They easily accommodate businesses of all sizes with a superior feature set and generous resource allocations. Wondering how Shinjiru stacks up against other Web Hosting companies? Enter any other Web Hosting company and we will give you a side-by-side comparison.